Welcome to Sekawati Impex. Manufacturer & Exporter of Bags & Aprons. Established in the year 1991, at Jaipur, we are an ISO 9001:2008, URS & UKAS certified company. Our Ultra modern manufacturing plants & Strong client base make us different from others. Customer oriented approach, Assured quality & eco friendliness help us to achieve an enviable position in the industry. We offer a wide array of Aprons, Drawstring, Promotional & Laundry Bags. Our Promotional, Tote & Shopping Bags are in huge demand across the global markets. 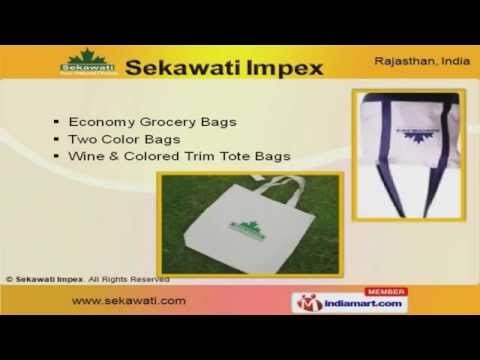 We offer a qualitative range of Economy Grocery, Wine & Colored Trim Tote Bags. Drawstring & Laundry Bags offered by us are available at affordable prices. We offer Net Bags & Sacks for Packaging Needs that are extremely reliable. We also provide Aprons that are a class apart.